With LAB we are now able to measure more accurately how efficient a network of a startup is and how close is to the core of a given ecosystem. To find out more about LAB, please read HERE. Moreno Bonaventura, 27, co-founder. Network analyst, defines the metrics and measurements to use. Luciano De Franco, 31, co-founder. Computer engineer, is the head of a great development team of friends and cooperators. Mario Scuderi, 27, co-founder. Managing engineer, product and marketing management. How useful your contacts are? Startup network will tell you. It is a web-app which measures the intangible, something that is only apparently intangible and gives exact answers. Where can you get to? You have got Facebook friends who live and work in the USA, Russia and China, for sure. Even in Finland. But, what is the real value of your network? “One of the measurements that Startup Network offers is the geographical diversity score. It gives an exact report of the geographical areas you access to”, Moreno says. He earned a degree in theoretical physics in Catania and he is currently a PhD student in London, switching between the Mathematics and the Business and Management departments. “We focus on startups because if founders have many contacts abroad the company is more likely to grow. On the contrary, if a startup is “closed” and focused exclusively on its geographical area will be less exposed to knowledge, experiences, skills and new technologies. Sign up to Startup network with your Facebook account. The web-app will immediately start analyzing some of your and your friends’ information, like age and geographical position. Subsequently, it will scan your network extracting some indexes like the age diversity score, which tells you if your contacts are cross-the-board, that is, if you have relationships with people older and/or younger than you. “It is an advantage compared to having contacts just with people of your own age. Older people can offer you more insights, while younger people – like the young IT specialist or the geek kid have a deeper knowledge of the latest technologies”. Another index is the Background Skills Score that is, your contacts’ specializations. As well as the age diversity score, It tells you if the specializations are many and diverse, or unvarying. If all your contacts do the same job it will be difficult to access to resources like technologies. Besides, there are diversity scores that measure the variety and diversity of competences you are exposed to because your network and location diversity. “I have got a location diversity index of 58.7, Mario’s is 70. That does not surprise me, I know well how much Mario travels through Italy and Europe”. You can compare yourself with other entrepreneurs in order to better understand who is doing better and worse. You can also submit your startup to the platform. “An incredibly useful instrument to evaluate a startup in its initial phase is its valuation. This is an essential figure when negotiating with investors: it is not just the company an the idea, the network plays a great role, too. The incubators can also check the health of the startup ecosystem andseeif startups are interacting each other. “Obviously, when companies are not interacting each other, the collective results will be lower than the ones achieved by an ecosystem in which there is an exchange of experiences, knowledges, and mutual help in solving everyday problems, like paperwork”. Facebook enacts trustful collaborations in a deeper way than in the other social networks. This is the reason why Startup Network chose to start with Zuckenberg’s social network, but in the next future it will also scan LinkedIn, and will be interesting to discover the differences. “We’re on Facebook with the public beta, and we are working on LinkedIn. Generally, it is believed that LinkedIn is more useful for work, but Facebook proves himself better in this field too, because it tells more about people. It enables more genuine and spontaneous relationships, because of the trust layer. A network can be made of different layers, Facebook represents the trust layer. It is more likely for two people to cooperate more sincerely on Facebook than on other social networks”. And now, business. Startup Network develops itself in two similar and parallel business lines.The first, the web-app, a free service for fellow startuppers.The latter is more pay money-oriented. “We analyze more than one thousand companies daily and calculate a score, which is slightly different from the one supplied by the web-app. We made an historical analysis, looking at startups’ last ten years’ records. This allowed us spotting some metrics that are generally related to a startup’s success. By using these metrics we perform a live analysis of the new startups which are being founded every day in different locations and we perform the so-called next big startups’ prediction.” Many venture capital funds invest on founders who are capable to communicate with others and so put them self into the ecosystem. The idea and the company, as we know, are two different things. “Startup Network came into being back in the 2011, with the Youthub association, which keeps Catania’s startup ecosystem alive. We were all students at the university, and we were understanding the value of cross-curricular competences. In 2012, we applied for the Working Capital accelerator and won the grant. WCap did not have physical location yet, now it’s an extraordinary organization. It gives you spaces and Telecom Italia’s presence makes you understand that you have important people’s trust. An huge stimulus, aside from the practical support, is the psychological one. 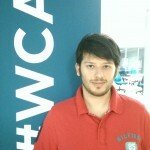 WCap’s messages are passionate and exciting”. If the people you know are all the same, it is like you have only one contact. If everyone offer you the same competences, resources and language, your network is actually not really big. It does not depend on the number of people you know, but on their diversity. “We have cut our teeth, made our experiences: Mario went to Silicon Valley and I live abroad. For instance, the technology we are currently using on the platform has been developed by a London-based company. Besides, we have recently reached an agreement with another London-based company, Tekja. They will provide their experience and their great data view to Startup Network. Italy is not a first-choice country for startups. but there is a great development in progress. I’m analyzing platforms data and the results are encouraging. We are small, but we are growing fast. I’m talking from a network point of view. Among Silicon Valley, Boston, Italy, Berlin and Chicago, the first is the best, but the so-called “Bel Paese” shows promising aspects. The number of connections, compared to the number of startups, is much higher than in the others area we analyzed. It looks like Italians love connections. In Italy, founders talk each other a lot, because they understand that, to grow, is necessary to share. Hence, there is only Silicon Valley above Italy. Berlin, London, Chicago, are below our level, they talk each other less, they’re more on their own. Interaction and exchange are typical Italian qualities, which reflect Italy’s Mediterranean way of thinking.